Candidates should have should pass their 10th, 12th or diploma with 60% with well recognized Board of India. Application for a scholarship for students who are doing distance learning courses will not be valid. Only students with regular courses can apply for these scholarships. Students who have passed 12th with at least 75% marks will get a scholarship of Rs. 10,000 i.e. Rs.1000/- per month. Students who are doing any 4-g-5 year professional course will get a scholarship of Rs.2,000/ - pm in their 4th and 5th year. Xerox copies of 10th, 12th and diploma self-attested. The first step is to visit the official website. Now take your cursor towards Menu bar and then select "New Application" and then click on "Apply Online “You can also hit on “New Application link. 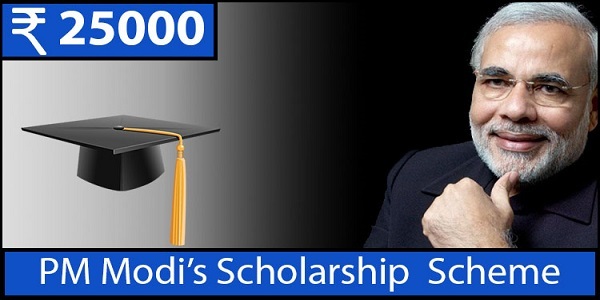 On the next page fill the PM Modi Scholarship 2019 application form. In the given registration form, you will have to provide all the information sought under Part-1 and Part-2. Fill the application form by providing complete details including details of bank account such as bank name, account number, branch name, and IFSC Code etc. Finally press the submit button and take a print out of submitted application form for further process.